The Martell Iconic Blueprints Experience is a series of networking experiences designed to recognize local emerging icons who embody the spirit of Martell, and use their stories to help foster dialogue and empower others. Each of the chosen icons embodies the vision of the Martell Man – they are strivers and leaders in their communities who are motivated to explore new challenges and opportunities to rise to the next level of their lives. They inspire others around them to defy and exceed expectations. Join me on November 20, 2014 from 8:00 to 9:00 pm EST for a Twitter chat to discuss entrepreneurship, blueprints for success, and blazing your own trail. During the chat, will will give away $25, $50, and $100.00 Amazon Gift Cards up to $300.00. If you’d like to start the conversation early, you can share stories, images,and quotes that inspire you to elevate yourself to achieve greatness in the comments section below. 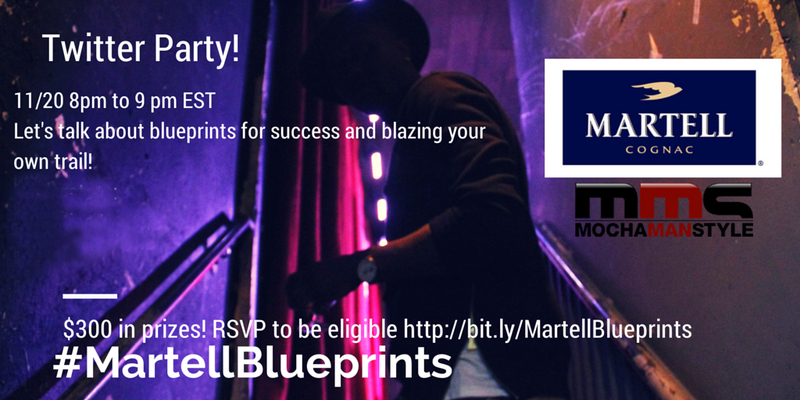 You can also share your stories via social media with the #MartellBluePrints hashtag.